Roguelikes hold a fairly sizable niche in the PC gaming world today, and for good reason. Partially characterised by permadeath – meaning there are no mid-game saves – roguelikes challenge you to think carefully about every move you make, lest you die and get sent back to the beginning of your adventure. This aspect of roguelikes has been creeping into other genres, such as the platformer with Spelunky, and tactical strategy games as seen in XCOM’s Ironman mode. But Into the Breach is, arguably, the best implementation of permadeath in recent memory. Did you know that Into the Breach teaches you to be a hero? 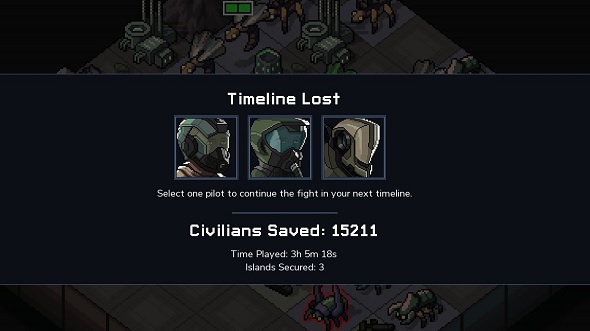 In Into the Breach, you play as a squad of mech pilots who travel between timelines to fight the Vek, an insectile alien species overrunning the vestiges of humanity. Fights play out on a grid-based battlefield where you must defend the civilian cities that power your mechs. On every turn, the enemy moves and telegraphs where it is about to attack, forcing you to react. This sets you up to neutralize the turn’s threats, either by defeating them, pushing them out of the way, or otherwise disarming them. Once the Vek deal enough damage to your power grid, or you manage to defeat the Vek in their hive at the final level, you teleport to another timeline, abandoning your mechs in the process. Unsurprisingly, Into the Breach has a lot in common with FTL: Faster Than Light, developers Subset Games’s previous roguelike. Like FTL, the permadeath design means you have to live with your failures as well as your victories, the game progressing regardless of how well you are doing. Not everything is erased between your runs, though. You get to pick one pilot to keep when you switch to a new timeline, and the achievements each squad earns can be spent to unlock new squads, who have different types of mech. Unlocking new squads becomes a game on its own as you play Into the Breach multiple times over, giving you something else to do even after you have had a successful run. What makes all this remarkable is that it is playing out across a grid-based tactics game. 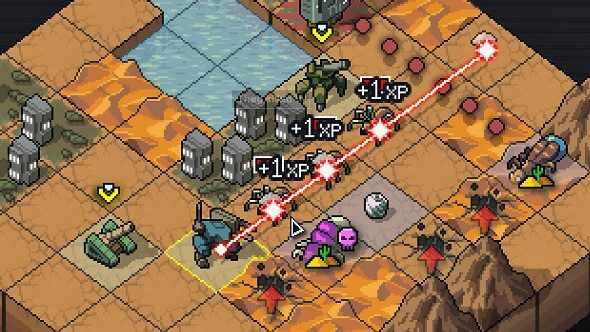 We know that this works well as XCOM proved it with its Ironman mode, but rather than presenting that as an optional mode of increased difficulty, Into the Breach uses that as its starting point. 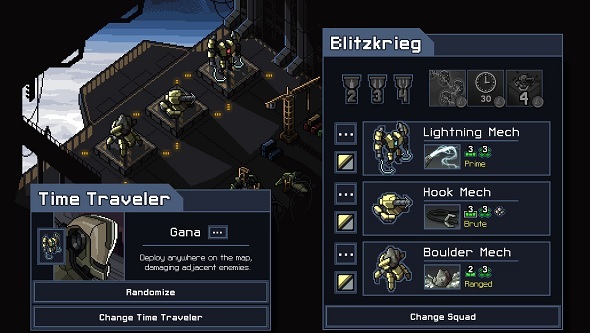 Not only is every single move in Into the Breach emphasized due to this, its time-travelling mechanic – which lets you keep one pilot for your next playthrough – has you think over the long term. At times, you have to evaluate the situation and cut your losses, making necessary sacrifices in order to protect the one unit you want to bring with you. Suddenly, your mission is not to win but to keep your VIP alive so you can come back stronger next time – even as you damn one timeline to oblivion. Into the Breach is about saving a particular timeline’s population, but it is also about damage control and forecasting for future runs. The permadeath in Into the Breach is entirely in line with what we have seen before in roguelikes, and indeed XCOM, but it gains a different kind of urgency here as we are forced to consider the fates of the populations who must endure each ruined future we leave behind. It is a heavy burden to bear, but it turns out that strategising amid the branching outcomes of the multiverse is one of our favourite guilty pleasures.